Getting bass to translate is one of the toughest things to accomplish as an engineer or producer. After many years of working with various genres (and making countless mistakes) , I have finally compiled a list of tips that will help you get your bass to sit right in the mix and to be heard on any playback system (including those wretched Mac Book speakers). But before we delve deeper, we first must understand a bit about the playback systems themselves, and how our human hearing affects the way we perceive “bass”. On a fundamental level, humans are able to hear sound because our ears (through a complex series of processes), pick up air molecule displacements (vibrations), and convert them into electrical impulses. Our brain detects these impulses and then, as a transducer, translates them into “sound”. On a piece of paper, humans are capable of hearing frequencies from 20hz to 20Khz. However that’s “perfect” hearing. Most of us do not have perfect hearing, and on top of that begin to loose sensitivity to certain frequency ranges as we get older. We pick up vibrations through hair cells in our inner and outer ear, and as we age, some of these cells began to deteriorate. The first hair cells to go are typically specific ones that are attached to our “outer ear” , the part of our hearing responsible for detecting high frequency content. So depending on your age when your reading this, you can have a very different hearing response than someone much younger or older than you. So the reason your old man can’t hear you isn’t necessarily that he is loosing all of his hearing, but most likely because he’s losing or lost some of those higher frequency hair cells (typically where the articulation of the human voice sits). Because of the way we humans have evolved, we are most sensitive to mid frequencies around the human voice (2-5Khz), and will hear these over other frequencies of the same SPL. This concept is widely known as the Fletcher Munsun Curve, and understanding this can help you greatly when mixing, and specifically when dealing with bass. The Fletcher Munson Curve refers to how our “frequency response” changes with volume. 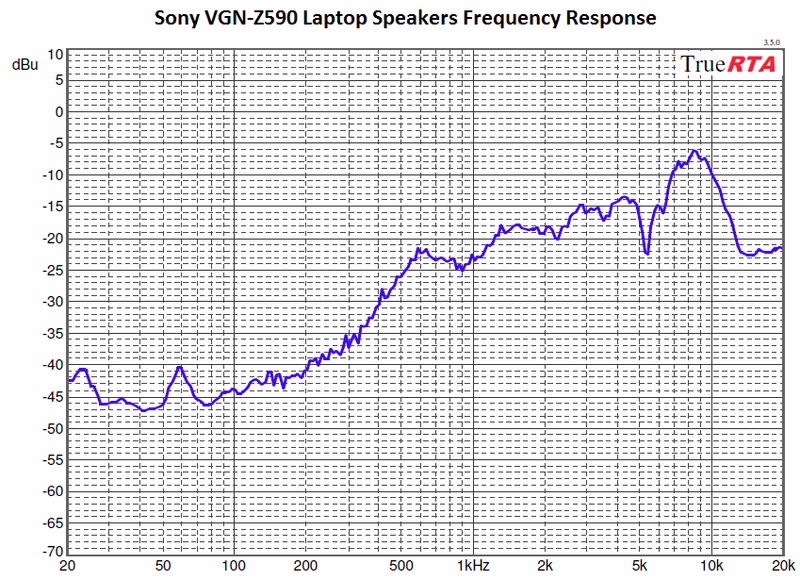 As shown in the graph above, when 1Khz is at 60db, it takes about 80dB to hear 50hz as the same perceived “volume”. A 20dB difference. 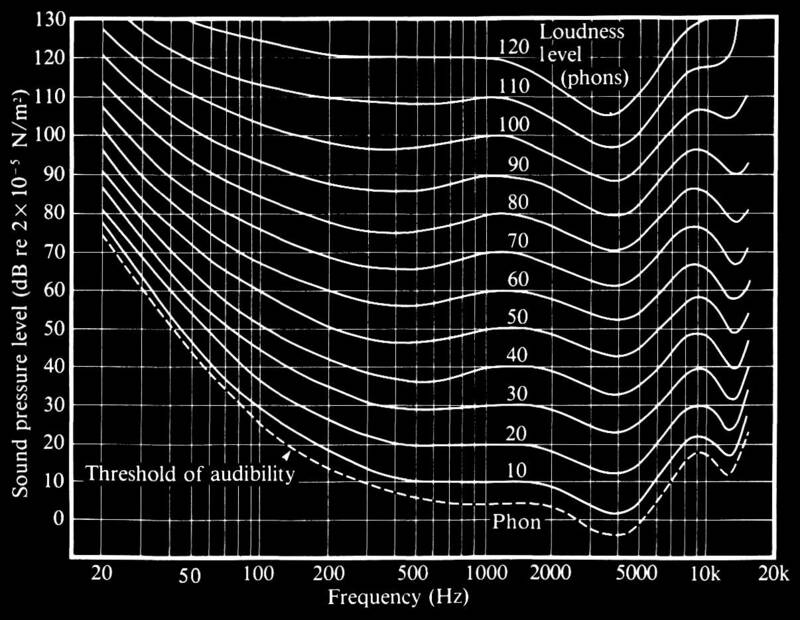 As the overall dB increases , 1Khz at 110dB will sound the same as 50 hz, if 50 hz is played only 10 dB louder. This relationship changes or “flattens” out as the volume is increased. So what does this mean for you? If you listen to your mix at a louder volume, things are going to sound equal and balanced in volume. Bass, mids and highs will seem in their place, but it’s is a trick! Once you turn the level down, all of a sudden bass (and some highs) get lost in the mix. You may not have chosen to turn the bass up when it is at a high level because it sounds present in the mix, but when played at a quiet or reasonably loud level, it is lost in the mix. On top of the frequencies flattening out, if the overall volume is loud when mixing the music, the song has a greater impact. This “greater” impact fools your ears into being satisfied. But they aren’t satisfied because things are clear in the mix, they are satisfied because the music is cranked and your body can “feel” the bass. You aren’t going to think anything is really wrong with the mix if it’s loud…so the solution? Monitor at low levels, and you won’t trick your mind into thinking things are balanced when they aren’t, especially when dealing with bass. Another reason to monitor at low levels is because it won’t interfere with the acoustics of your room as much. If something is cranked, and you’re in your not so perfect sounding bedroom, then that will reflect in your mix. Low frequencies will be boosted, standing waves will cause strange phase issues, and your mix will be all wrong. Listing at a low level, will eliminate any problems relating to acoustics, and will give you a more direct , unaffected sound. Monitoring at low volumes isn’t at all a new concept, and has been a “secret” of mix engineers for decades. This “secret” is based off of the concept that if it sounds good quiet, it’ll sound good loud, but if it sounds good loud, it wont’ necessarily sound good quiet. After all a good mix sounds good at all volumes, on all playback systems. So next time you listen to a professionally mixed and mastered song on a laptop, or cheap playback system, listen to how the bass is audible and clear. You will find that even on your cheap 15 dollar portable whatever, that you can still hear the bass, crystal clear. Why is that you ask? Keep reading and you’ll see why. It’s 2014 and we have entered an era where people are no longer listening to your mixes on vinyl through a good home stereo system. Now your audience is listening to your music on mp3 through their macbook speakers, cheap ipod earphones, and ihomes. There is even more demand on getting your bass to translate because, with the exception from the earbuds, these are playback systems that generally struggle to reproduce fundamental bass frequencies. Here are two frequency response graphs that illustrate this “lack of low end” The top graph is the frequency response for a Mac Book laptop, and the bottom is for a Sony laptop. Looking at these graphs, one can see right away that there is a serious roll off of low end around 200-300 hz and below. As you may know this is where most “bass” or low end sits in a mix. So why can you still hear the bass on professionally made albums through your laptop speakers? It’s because the artist, and engineer learned to compensate for this issue. . Similar to what I said before about having your mix translate if it is monitored quietly versus loudly, if your bass sounds good through crappy speakers, it will sound good through great speakers. This is why you will see many professional studios, and even some home studios using “unflattering” speakers to run their mixes through. Speakers like the Yamaha Ns10’s are a staple in the recording industry not because they sound good, but actually because they sound “bad”. Many good artists are aware of this problem, and consciously try to avoid it during the writing process. Something amateurs do often when making music, whether it’s hip hop, house, rock or what have you, is to choose bass that is bone rattlingly low because it sounds “epic”. While this may sound “epic” in your Dre beat headphones, it’s not going to sound good anywhere else. Trust me. A good way to avoid having a lost bass, is to play either an octave higher than you normally would or if that’s too high, if you can play a different arrangement somewhere in between. As we discussed earlier, our ears are less sensitive to frequencies that are lower, and tend to gravitate towards ones that are higher in the spectrum. So bass with more upper mid/high end content is going to cut through easier. But that’s not bass anymore you say? Well actually even a bass line played in an upper register will still contain alot of low end content and also point to the fundamental bass frequency (a nice little trick you can thank your ears for). As a general rule, for most genres I’d say stick away from writing in a sub bass line if you’re worried about bass translation. This is not to say sub bass can’t be used, but it all depends on where you are using it. If you have a bass with alot of low end content already, adding a sub is only going to make things worse. If you have a bass that hardly contains any low mid “meat”, you can put a sub on there . And if you do put a sub on there, filter out the highs, and low mids, so when combined with the actual bass, won’t sound muddy. Sub can easily destroy a mix if it isn’t sitting in the right place so take the time to make sure it sits in the right place. If your an engineer, and you get a bass line that is too low to be heard on any small playback system and can’t be changed, don’t panic, there are a few things you can do. The engineers over at Waves realized the issue of bass translation, and actually made a plug in specifically designed to help bass translate called Maxbass. Without getting too technical, Maxbass basically duplicates the signal, adds new upper harmonics to it then mixes it back in with your original bass. It’s essentially adding more audible frequencies to your bass to make it more audible for the listener. Simular to what maxbass is doing, a great way to get your bass heard is to add frequencies that are more easily heard to it. By adding a bit crusher, or sample reducer you can add upper harmonics that will give your bass a lift in the mids and highs to make it stand out in the mix more, all without actually boosting the volume of it. Or try running your bass through a saturator, or subtle distortion effect. Used in parallel, can produce wonders for a bass. 3) Run Your Bass through a Transformer. Compressing bass can increase the overall subjective volume of it, and will help keep a more constant level throughout your track. Compression also naturally brings out the subtleties such as the sound of the pick, and guitar slaps that are more audible to our ears. Increasing these will increase the over all presence of the bass. Compress away! Sometimes the kick drum may have too much low end content and will be masking the bass. By side chaining the bass with the kick, you can increase intelligibility greatly between the two instruments, and as a result your bass will sound more present. Also, if the kick is in the way, roll off some low end content . When combined with the bass, the low end of the bass will fill in what the kick is missing and your ears will assume it’s from the kick. Try simply boosting upper frequencies , and taking out some mud to improve intelligibility. It doesn’t hurt to roll off some sub on the bass either. Rolling off frequencies (like 30hz) we can’t hear well anyway will only make the bass cleaner, and adding upper frequencies around 1khz for example will bring out the presence of the bass more. Try listening to your finished product on various playback systems to get an average of how the bass sounds. Check it on the laptop. If you can hear your bass clearly on a mac book for instance, in my opinion, you’ve nailed it. Also one of my favorite tests is to hear how it sounds is on my ipod earbuds. Because I listen to alot of music through these while i’m out and about, I have a good reference of my how bass stands next to other recordings. Or if you have a car, that’s always a good test too. The point is to try it all over,so that you can make adjustments as necessary. Follow these tips and you’ll be well on your way to crafting bass that translates! For recording in Chicago hit up Dan at Studio 11! Awesome post! I’d say that getting the low end right is probably one of the biggest things I struggle with right now.I would love to hear what a transformer does to a bass signal…just might have to take you up on that! Thanks for the helpful tips and info! thanks for this! I wondered about that. I work with a great bassist and want his parts to pop out. What about re-recording the track and running it thru some plugins or my bass pod. Great article and very helpful! But I would add that, like older ears, older eyes can have a hard time reading this grey type on an all black background. I made a similar mistake on the graphics of a cd production of mine and heard about it later! thank you for your post explaining ‘bass ‘ in an understandable way.. there are many posts on this subject but yours is detailed and well written and very clear to understand ..i look forward to reading other posts you may have ..
Great post Dan. When you say mix with a low volume, what dB are are you talking about? Something like 80dB or lower?